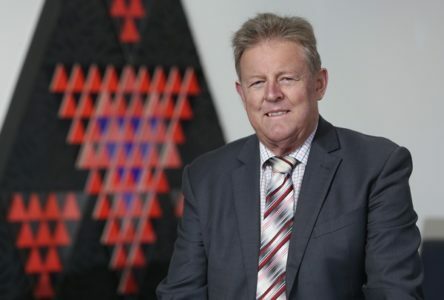 After eighteen years as principal of Macleans College, Byron Bentley is set to retire. Reporter – and former Macleans student – Kelly Teed sat down for a chat about his extensive career. It’s a phrase any student or teacher who has passed through Macleans College at some point in the last 18 years will surely recognise. For many, it will be synonymous with former deputy principal Jim Lonergan’s infamous “Roll call please” at the end of each school assembly on a Friday. As a proud Macleans graduate, I have strong memories of the routine assemblies. The school would stand as the principal and head prefects would walk across the stage to be seated where Byron Bentley would deliver the well-known phrase and the school would be seated. But come the end of Term 4, Mr Bentley will cross the stage for the final time. Many of the former – and presumably the current – school community were shocked by the news – and after 18 years in the role, the surprise is understandable. But “it had to happen sometime,” said Mr Bentley, smiling wryly. He’s spent more than 40 years in the education sector – he initially cut his teeth in the role of principal at Western Heights High School in Rotorua for six years before moving to Macleans. His ‘have-a-go’ attitude has resulted in a career spanning decades. It’s the people he thinks he’ll miss most. As a student, you don’t often see teachers – let alone principals – for the kind of people they really are. They pile you with homework and assignments and occasionally scold you for being late to class, or an untucked uniform shirt. But what we don’t realise until after we leave school is just how hard they work and how much they genuinely care about and want their students to succeed. As I sat down with Mr Bentley six years after leaving the school – admittedly after I impulsively checked to see if my shirt was tucked in – I saw a whole new side to the man I listened to in assembly nearly every school week for five years. His obvious passion for the entire body of the school – staff, students, senior leadership team and beyond – shines through. He speaks passionately of the achievements of current and former students, which he says is married up to being well supported at home along with “dedicated, high quality staff that the school has always had”. “We’ve tried to keep going for the last 18 years in my time… the aim is to have every student to leave here with a qualification – a ticket to ride – if you like. He credits the whanau house system and the vast range of extra-curricular activities available as helping drive the academic success that Macleans has become so well-known for. “It’s a broad term – not everyone has to go onto university – but the vast majority aspire to do that and that’s good. We’ve got other pathways – if you want to become successful in a trade area or a vocational area – call it what you like, it’s all the same to us. “We just want to make sure you get there,” he says. He’s a strong supporter of the music in schools – he says it’s “one of the crown jewels of the school”. Now in its 38th year, the school is no longer young, says Mr Bentley. “When I started here back in 2000, it had two previous excellent principals and I was just hoping to emulate them and keep enhancing the school. After eighteen years of school bells and routines, there’s no concrete plan for what’s next for the education extraordinaire. As for that final school assembly? Well the Anzac Day Dawn Services and Civic Services in Howick and around the country went off without any security problems. Do you think the police over-reacted with the security and banning of Anzac parades/marches?